The blog about Alexander, seems to have been so long in the making. It seemed only a few months ago I was asking for information from libraries, archives and companies. The truth is that I started enquiring in January of 2014…………….dosn’t time fly when you are having fun! I must have been having too much fun…..but then I can’t remember enjoying myself that much last year! My quest for information about Alexander had started many years ago, and like many other researchers, have put certain people on the ‘back burner’ ready for another day……….well they are not going anywhere, are they? It was during a long weekend in Lossiemouth, while visiting my aunt Gladys that my husband and I trawled the kirkyards in the area looking for Riach, Hay, Younie, Petrie and other names connected to mums family. The weather was sunny, but a little bit cool as I scanned the headstones, three rows at a time, looking for family connections or something of interest on the family markers. Although, the headstone to Alexander and Helen was interesting due to the family name, it was how and where Alexander died that struck me as interesting and quite surprising. Who is Alexander? Well, he is the husband of my 2nd cousin, 3 x removed. But saying that his wife’s grandmother was also a Riach. 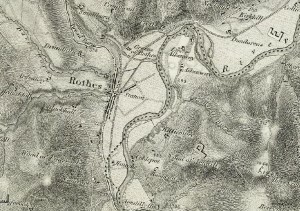 Rothes map – Vision of Briain. Alexander Riach was born in Dallas in 1828, and being baptised in Rothes on 18th October 1828. He seems to have spent most of his time in Rothes, the son of James Riach and Annie Innes – James was from Rothes, but not sure about Annie. In the census of 1841 and 1851 he is living on New Street, Rothes and working as a mason. 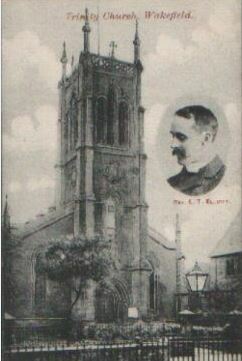 Alexander Riach, on Friday the 18th of January, walked up the aisle of Rothes kirk as a married man, after marrying Helen McKerron. Wet and unsettled conditions had set in a few days before their wedding day and did not turn for the better until April – I hope they had a reasonably fine and clear day for their nuptials. The census came around in 1861 and the couple, now with two young children were living at Kirton Street, West Side, Marnach, Mortlach. Alexander, still working a a mason, was now working on the railway. Ten years down the line in 1871, the family has grown and Alexander is now father to four children, aged between 13 and 5 month old Margaret. Home is now Easter Ardchyle Hut, 2, in the Perthshire village of Killin, where Alexander is aged 42 and a mason. Alexander and his family seems to be quite elusive in the 1881 census but a bit of a tea break, finds the family not together. Helen is living with 2 of her children in the home of Margaret McKinnon, the widow of a mason, at Station Street, Rothes. Where is Alexander and the other children? After searching through the census for Scotland, with knowing where he died………….you will have to wait a little longer for that information! I looked in the England census and there is an Alexander Reach, aged within reasonable ‘give or takes’ from the last census and born in Scotland. living in Barden in Skipton, working as a contractor manager for the new reservoir………..could this be him, living on his own and stating he is married? Ten years later in 1991, there was quicker success – Alexander and Hellen are now living back together at Cressbrook Cottage, Queens Road West, Old Machar, Aberdeenshire and now employed as a manager at one of the local granite quarries. You now know a little about Alexander up to 1891 but what happened to him later………..? I did the usual quick research by Google, looking for anything that could be remotely connected with how he died. You know the things, confirming his death on the GRO, just incase the headstone was wrong – it would not be the first time. I looked for any notification of any thing connected with his death that might have been in a local paper and scanned for online research……….nothing, but I did come up with a place that could be worth a visit sometime. It was some years later while visiting our daughter who lived in Chiswick at the time, we were staying in a very nice pub opposite Kew Green. We were due to meet her for lunch where she worked but had a while to kill, so we had a little drive around the area and drove past a building that woke the old grey matter and a eureka moment came. It was after lunch and on our way back to our lodgings that we called in. The place was closed but a few of the workshops were open. The one I called in at, was a blacksmiths, a lady blacksmith and her work was fantastic. After asking if this was Kew Bridge Works, she said yes, but everything was closed for the day….another visit was called for. The next day I had found myself in a small, cluttered office, talking to one of the curators, who knew nothing of my man and his demise but she took my details and would pass them on to a volunteer researcher who went on a regular basis to the Metropolitan Archives……………I should wait! Waiting is not a thing I am known for where family history is concerned when I have bitten the bullet, but sad to say I am still awaiting their reply, probably six years down the line. So it looks like I would have to continue something I started years ago, but on my own terms, with this new vigor, I rang the Registry Office for a death certificate but which office to contact would it be Richmond or Brentford. I said I would tell you later about how and where he died – it looks like now is a good time to tell you. 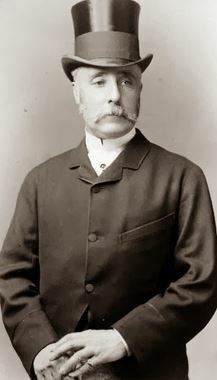 Alexander Riach died on 31st of March 1900, as his epitaph tells ‘accidentally killed at Kew Bridge Works’. I tossed a coin and came up with Richmond as my first port of call, as I was convinced he had died in an accident at what is now the Museum of Water and Steam, Kew. The very nice person at the Richmond office, assured me that if I had the wrong office, I would, of course, get a refund. Five long days later I had the certificate in my hands and although saddened by how Alexander met his maker, for a family historian, the way in which someone leaves their mortal coil, can mean there is more information to be found. 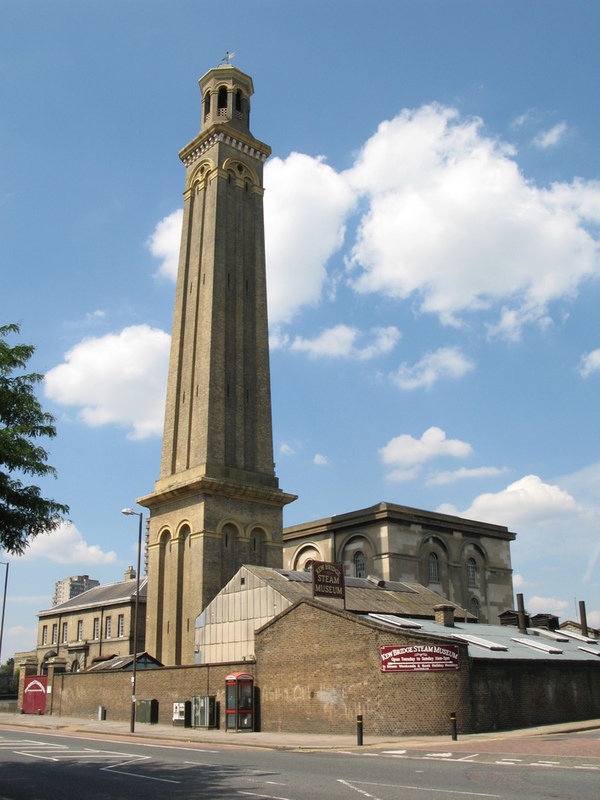 In 1900 he was living at 14 Bushwood Road, Kew and although, 71 years of age, was te Contractor’s Manager at Kew Bridge Works – as per his headstone, and still had me thinking about the steam museum building. I had the impression, that with this information being marked on his headstone, for all the world to see, well those who visited the kirkyard, that te family were upset, annoyed and probably felt that it was someones fault, but whose? The death certificate, as you know, gave me the date of death, his age was 71 years and we know his occupation but it was the cause of death that came as a shock. He died of ‘Syncope from shock due to fractured ribs crushed by crane toppling over whilst being moved from barge to landing stage’. There was a post-mortem and a verdict of Accidental Death was given by the Coroner for Surrey, A Broxton Hicks after an inquest held on the 4th of April 1900. ‘An inquest was held in Richmond on Wednesday, touching on the death of Alexander Riach, manager of the Kew Bridge Works, who was killed by the falling of a crane. Mr Gibb, the contractor for the works, was represented by a solicitor. Evidence as to identity having been given by Margaret Riach, daughter of the deceased. 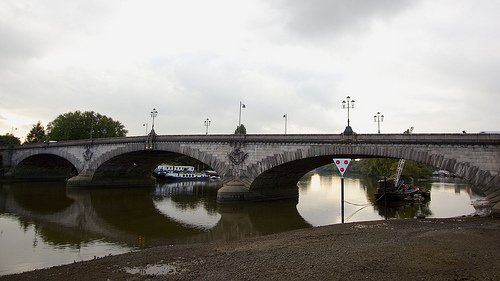 William Watson, a labourer, 2 York Villas, Kew, said that for the purpose of assisting in taking down the old bridge they had a steam crane on runners on a barge. On Saturday, the manager asked witness and three others to remain behind to take the crane from the barge on to the wharf. It was quite steady in the barge, but (the crane) had not been used in it, only being there for the purpose of moving. The deceased came to the wharf about 2 o’clock, and they began to move the crane a few minutes later. The top of the barge was level with the wharf, and they were going to move the crane on to the wharf by means of rails. They had begun to move it, ad it was half-way across, going by steam, when some steamers came up river, and the wash caused the barge to rock. Deceased was standing on the wharf near the crane, when it suddenly toppled on to him. As it swung back, they managed to get the deceased out, and assistance having been called, he was conveyed in a cab home. Henry Kennison, a labourer in the employ of the firm, corroborated the evidence of the previous witness. He was on the barge, and the crane as it was tilted, caught the witness by the clothes, but did not injure him. Thomas Graham Menzie, 17 Bushwood Road, Kew, engineer to Mr Gibb, said he was o the crane on the barge on the Surrey side, and it was then quite steady, standing so for several days. Deceased had had over fifty years’ experience with cranes. After the accident happened, witness had the photographs produced taken. In answer to Mr J T Mackie, factory inspector from the Home Office, the witness said he thought the crane was safe with the jib on. The crane was not in steam at the time of the accident. Dr Ernest Payne, who saw the deceased, said about eight of his ribs were fractured, and he was considerably bruised on the side of his body. He died from syncope, following upon the shock of the accident. A verdict of ‘Accidental Death’ was returned’. It was this article in the paper that told me where the accident occurred, I had wrongly thought that he worked at the Kew Bridge Waterworks, but no it was infact, Kew Bridge, works. 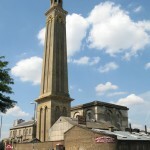 It was a very nice man at, yes, the Steam Museum, formerly, Kew Bridge Waterworks, that confirmed a few points. 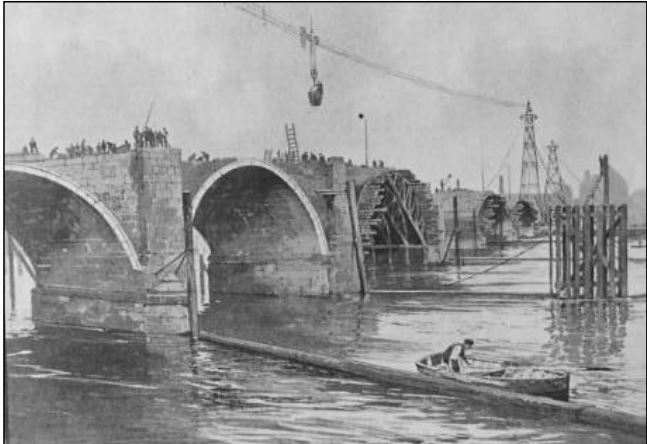 Firstly, that Mr Gibb, the contractor, at the inquest, was in fact the contractor for Kew Bridge, when the new bridge was built between 1899 and 1903. The dates fit with Alexander being in Kew and Mr Gibb, also fits in. It looks like Alexander was involved with the building of the new Kew Bridge and the demolishing of the old bridge. Kew Steam Museum, came good in the end! After years of waiting to find our why ‘accidentally killed at Kew Bridge Works’ is written on Alexander’s headstone, I now know. But, this information make me want to ask more questions, such as:- How long had he been in London, and were his family with him. We know Margaret, his daughter identified the body. But, was that as she was the only family member with him and was basically, his housekeeper. Or, had his wife Hellen, been too upset to view her husband, or had she stayed in Scotland? The inquest tells that he had worked with cranes for fifty years, was that because his job as a mason involved moving heavy stones and he had gained his experience there. I may never know the answers to some of the questions, but my family tree certainly has more information about Alexander and his family now than it did. As I have said I know more about Alexander than most people now. There are many trees on Ancestry that include him, but some have his birth details, some have his death details, and some don’t even have his parents, but although the odd one, and I do mean the odd one, has his death but nothing else. Could it be that none of these people have seen his headstone? It is possible that his demise is not common knowledge as many researchers could be from America, Canada or Australia and have not ventured to Morayshire. I looked for a Will in the English records but nothing, so I took my ‘plastic’ in my hand and I might add it took some prizing out of my purse, but eventually, I paid a fee to Scotlands People, now that breaks my heart – why will they not do an annual subscription? Wills are free to search, and there he was, confirmed by his wife Helen McKerron, also being in the index. 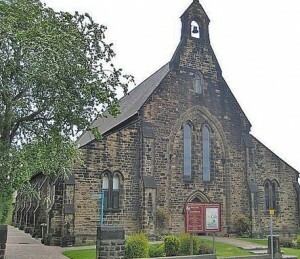 I now have his will and can see that he had property in Rothes, its proximity given quite clearly on the written pages and how after both his and Helen’s death, which occured in December of 1909, what should happen to their property. This entry was posted in News and tagged 1901, 1911, Ancestry, barge, crane, Dallas, Elginshire, family, Find My Past, Kew, Kew Bridge, Kew Bridge Works, Killin, London Museum or Water and steam, Martach, memorials, Morayshire, River Thames, Rothes, transcription, Wills on March 21, 2015 by carol.